Katharine Hepburn was an American movie and stage actress who had a total of 12 Oscar nominations for Best Actress of which she won four. In 1999 the American Film Institute named Katharine Hepburn as the greatest female star in Hollywood history. She was born Katharine Houghton Hepburn on 12 May 1907 to Thomas Norval Hepburn, a urologist, and Katharine Martha Houghton, a feminist campaigner. In 1921 Katharine discovered the body of her brother Tom who had committed suicide by hanging himself from a beam with a bedsheet. Seven decades later in 1991, Katharine revealed in her autobiography that she had been using her brother's birthday instead of her own. It was at that time the public learned her true birthdate. 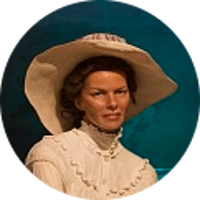 In 1952 Katharine Hepburn received an Oscar nomination for Best Actress for her role in the movie African Queen. Ironically Katharine Hepburn and her co-star Humphrey Bogart, who won the Best Actor Oscar for his role, were 7th cousins through their common ancestor of Joseph Morgan. Other notable celebrities with kinship to Katharine Hepburn are Clint Eastwood and Bing Crosby. She is a descendant of Mayflower passenger William Brewster and has royal family connections with Princess Diana, Prince William, and Prince George. Presidential kin include Millard Fillmore and Zachary Taylor. Katharine Hepburn also has a kinship to John Hinckley Jr. who shot President Ronald Reagan.